"You don't have an erosion problem until you build something too close to the water." --Attributed to coastal geologist Orrin Pilkey in this article on the spending of $240 million in federal funds to preserve Texas Gulf Coast beaches. Tuesday, July 9, 10:00 to 11:00 am, Edgartown. Program offering young naturalists a close-up look at native animals of Martha's Vineyard, combining a story, craft and a look at the "creature" of the day. For children ages 3 - 5 with a parent/guardian. At Felix Neck Wildlife Sanctuary, $9 ($6 for members). Wednesday, July 10, 7:30 pm at the Polly Hill Arboretum. Join horticulturist Dan Benarcik for an introduction to the use of ground covers in our garden designs. Learn how to incorporate these plants into our landscapes for both garden aesthetics and to provide a sustainable alternative to a monoculture of turfgrass. $10 ($5 for PHA members), for more info call (508) 693-9426. A free Felix Neck program that explores a different aspect of Sengekontacket Pond each week. From the birds above, to the creatures below the water's surface, this program includes hands-on activities and engages all ages. Meet at the Little Bridge (north end of State Beach). Sponsored by Friends of Sengekontacket. For more info, call (508) 627-4850. Monday, July 22, 4:00 to 6:00 pm, V.H. Community Farm Day at Thimble Farm: visit the farm and learn about the Island Grown Initiative. Light refreshments served. Thimble Farm is located at 80 Stoney Hill Road (map). Wednesdays, 10:00 am to 6:00 pm, Chilmark. Native Earth Teaching Farm is open for tours and animal visits Wed., Sat. and Sun. throughout the summer. Also, Weds. mornings are Toddler Time, where toddlers and their adults can meet and play in a fun and unfettered environment. For more info, see website or call (508) 645-3304. Fridays, 10:00 am to noon, West Tisbury. Vineyard Habitat Network (a program of The Nature Conservancy) hosts volunteer days every Friday, weather permitting, at the Hoft Farm Native Plant Nursery. Tasks include planting, watering, weeding, pruning, and collecting seed; work is outdoors, so be prepared for bright sun and biting insects. 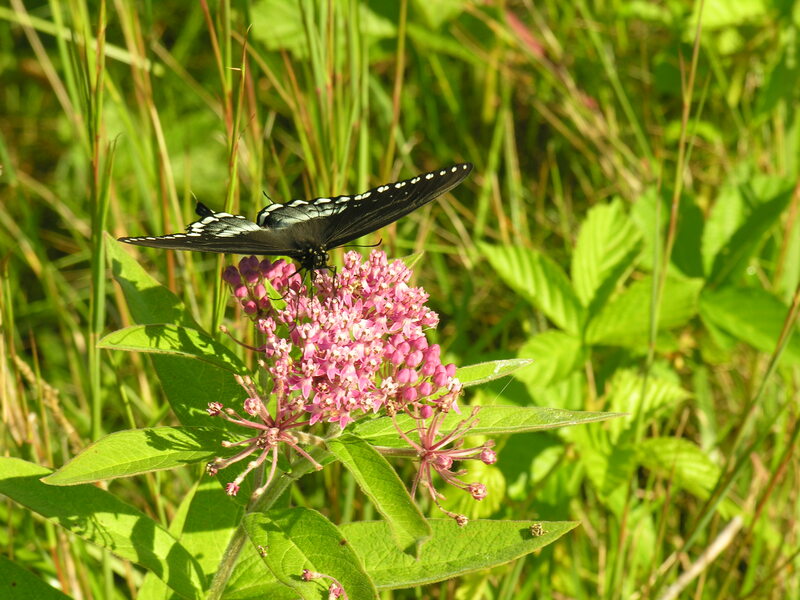 Volunteers may receive seeds and cuttings and will gain experience with native plant identification and ecology. For details email or call (508) 693-6287. A staple of the Vineyard farmstand, but relatively unimportant to the modern supermarket, swiss chard can be a bit of a tantalizing mystery. With it's attractive brightly colored leaves, readily apparent healthfulness, abundance and low price, it would surely be more popular if more people knew what to do with it. Under-appreciated Island treats are when we turn to Ginny Jones' cookbook Fresh from the Vineyard. Her entry on chard has serving ideas, but also tips on care, cleaning and storage. Fresh from the Vineyard, by Virginia Jones, features recipes that take advantage of our bounty of local produce, meats, and seafood. Proceeds from sales of the book (see VCS website for locations) will benefit both VCS and the Island Grown Initiative, two organizations that – in very different ways – have helped promote and sustain local agriculture. Thanks to presenters Phil Henderson and Paul Goldstein, and the well over 100 members (and future members) who came out for a memorable Annual Meeting. Special thanks to staff and board volunteers who helped create an engaging evening of discussion of sea level rise, biodiversity, and the many important issues relating to conservation on Martha’s Vineyard. Entomologist and evolutionary biologist Paul Goldstein of the Smithsonian Institution closed out the event with an engaging tour of several of our most unique, fascinating, and threatened species and their habitats. If you missed Dr. Goldstein's talk (or would just like a better look at his many great photos and graphs), check out this video by Dan Martino's M.V. Productions. Contributed by Terry Appenzellar, who just completed an accomplished term as VCS Board President -- Many thanks! 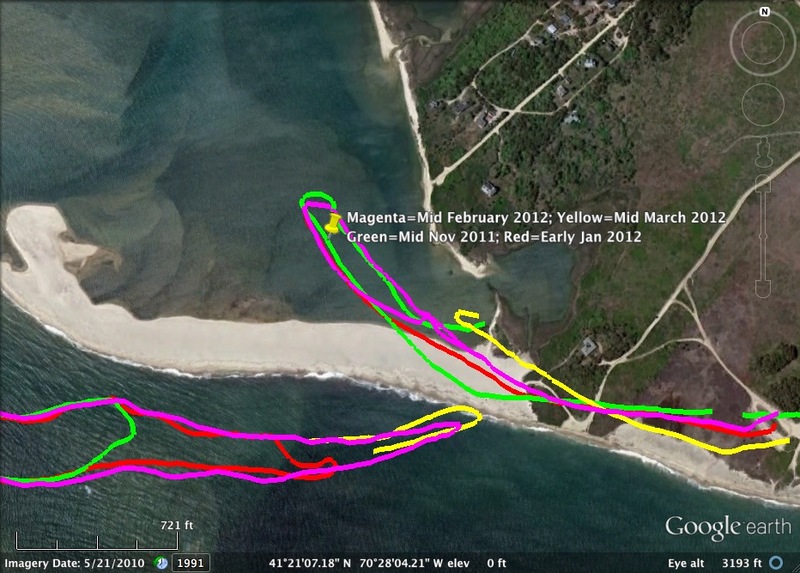 Currents ... tides...waves...storms... surge... shoaling sands... it remains something of a mystery exactly what is driving the openings and closings of the inlet at Norton barrier beach and the frequency and magnitude of changes at Wasque on Chappaquiddick. But it is not for lack of caring local observers, or for that matter, of a dedicated team of scientists who are currently documenting the comings and goings of water and sand at this iconic Vineyard location. And, apparently, the answers are of national importance to our Department of Defense! We Vineyarders are blessed that the Office of Naval Research thinks Wasque might be a model for other dynamic coastal systems; they are funding a team of research scientists at Woods Hole Oceanographic Institution to prepare long-term data studies of this complex system. Contributed by Luanne Johnson, coordinator of the Research, Monitoring, and Restoration Poster Project. If you regularly visit the Chilmark, Edgartown, Oak Bluffs, or Vineyard Haven Libraries, you may have noticed a new display project: The Research, Monitoring, and Restoration Poster Project. Each month a new poster arrives at these libraries, with topics varying from wildlife monitoring projects to shellfish biology investigations to statistics on the annual VCS Beach Clean-up. Every poster circulates to each of the four libraries, completing the full circuit in four months. So, if you miss a poster, you can always visit it at its next location. Island librarians have been very welcoming and are helping engage visitors by rounding up relevant books and media from the shelves for supplementary learning. For July, Chilmark is hosting a BiodiversityWorks poster on Belted kingfisher and swallow nest burrow monitoring; Edgartown has a poster on Dragonflies and Damselflies by TNC’s Matt Pelikan; Oak Bluffs has a poster on VCS’s Earth Day Beach Clean-up results by Jeremy Houser, and Vineyard Haven has Shelley Edmundson’s research poster on the effects of temperature on development of juvenile whelk. Click here for the complete schedule, and mark your calendars and be sure to visit some of these posters when they come to a library near you! President Obama’s recent announcement that he would take executive action (outside the purview of Congress) to regulate greenhouse gas emissions was greeted by the Washington press with a lack of scrutiny the president is not likely accustomed to receiving. No cable news channels covered the address live (though a transcript is available here). Then, the Sunday morning news discussion shows, long considered an arbiter of what “mattered” in the news in a given week, all ignored this major change in federal climate policy. But fortunately the TV viewers of America were not kept entirely in the dark, as our intrepid late night comedians rode to the rescue. In addition to the Daily Show, which typically features political humor, the traditional late night shows of David Letterman and Jay Leno also found the new climate policy to be newsworthy (thanks to Climate Progress for the catch). Maybe it’s just as well given that the format of the “Sunday shows” is adversarial political discussion, where loyal soldiers of the two parties square off by trading scripted talking points. There is little doubt that discussion of what Obama’s plan actually entails would be quickly dispensed with in favor of another partisan FUD-fight over whether climate change is real, human-caused, and/or a problem at all. But sour grapes aside, it is disheartening to see climate deemed a non-issue yet again. Copyright (C) *2013* *Vineyard Conservation Society* All rights reserved.